This month, the Velveteers challenged each other to go traditionally Asian with a classic seafood noodle soup, Laksa. 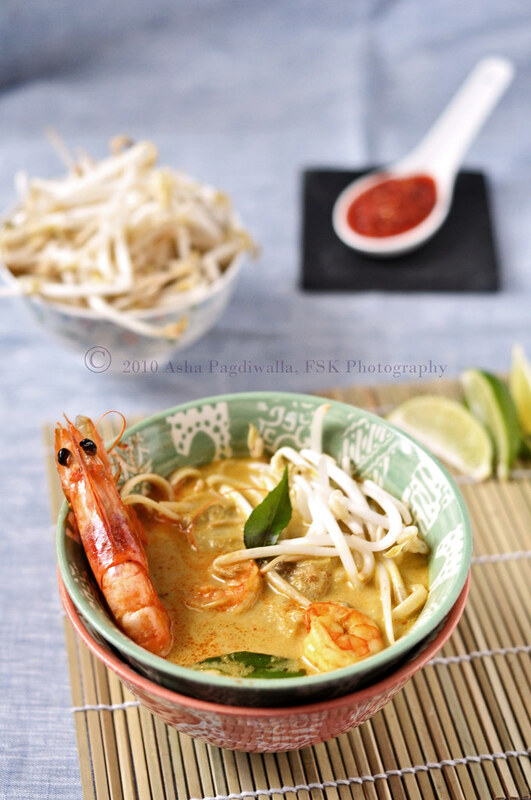 A simple search will tell you that the Laksa is pretty popular in many East Asian cuisines with each region creating their own take on the spices composing the broth as also the noodles that are served in it. I was super thrilled when we decided the dish for the month, since this spicy, coconut-y seafood soup has been on my to-do list for a very long time! I love seafood and any dish that use multiple varieties of it to create depth of flavor is a must-have, like the Bouillabaisse. 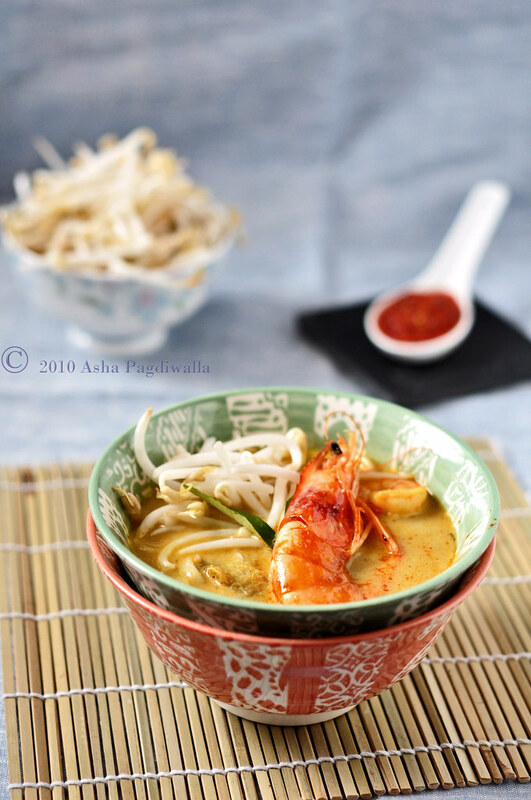 Speaking of which, I had an epiphany as I was sauethe base paste today; Laksa is really an Asian Bouillabaisse! After debating over the different types of Laksa from the apparently easy Laksa Kelantan to Curry Laksa to the Laksa Lemak, I decided to make the last. I have always liked dishes with freshly ground spices and the idea of creating the base for the soup from scratch using dried shrimps et all, sang to me. It was a done deal.... until I went shopping! Armed with the actual list of ingredients, I set off to find them. Little did I expect to make-do for quite a few of them. My first hurdle was with finding Laksa leaves. I read somewhere that it is Vietnamese mint but the guy at the store said they are similar to curry leaves, which, fortunately I had on hand. Next, was Laos powder, which is galangal powder. I didn't expect to find that but I failed to find even fresh galangal. So I subbed with regular ginger. Anyway, despite these initial hiccups, the rest went smoothly. The recipe itself is very easy and making fresh shrimp stock really develops a wonderful flavor in the soup. My only negative would be that the fish seemed to be out of it's depth in this dish. Unlike the bouillabisse, this soup was heavily one note and I felt, it would be just fine with just the shellfish in it. Verdict: For it's ease in making it, wonderful flavors and a sheer perfect meal for Fall, I will definitely make it again! In a sauce pan, heat the oil and add the shrimp shells. When they turn pink, add the water and a little salt and bring to a boil. Lower the heat and the simmer for about 45 minutes until it has reduced to half. Drain out the shells and reserve the broth for the soup. Soak the chillies in hot water for 10 minutes. Grind together the chillies, ginger, onion, lemon grass, shrimp paste to make a smooth spice paste. Heat a wok and saute the spice paste until the raw onion smell goes away. Add turmeric and coriander and saute for 2 minutes. Add the shrimp broth and bring to a boil. Allow to simmer for 30 minutes for flavor to develop. Add the coconut milk and cook for another 10 minutes. Then add fish. 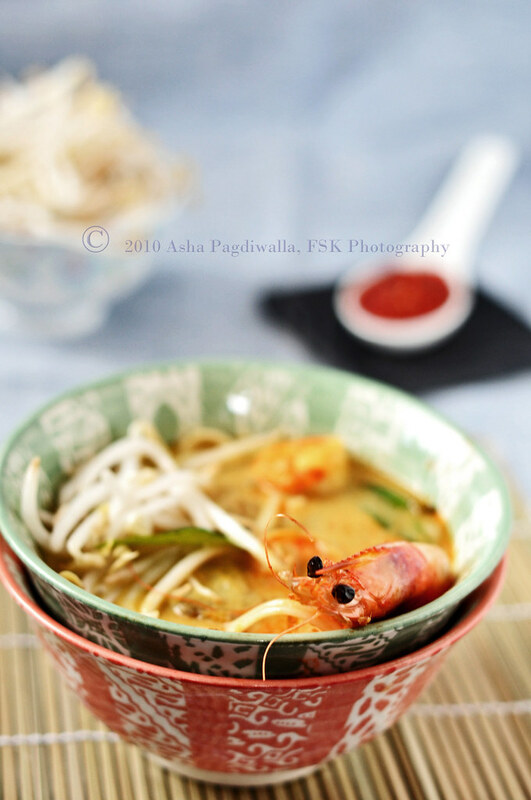 While the fish is cooking, lightly saute the shrimps and add to the Laksa. Meanwhile, cook the rice noodles per instructions and keep ready. To serve, portion out the noodles and then top with the Laksa. Top with bean sprouts and a couple of curry leaves and serve with sambal and lime wedges on the side.